We consider two-player partial-observation stochastic games on finitestate graphs where player 1 has partial observation and player 2 has perfect observation. The winning condition we study are ε-regular conditions specified as parity objectives. The qualitative-analysis problem given a partial-observation stochastic game and a parity objective asks whether there is a strategy to ensure that the objective is satisfied with probability 1 (resp. positive probability). These qualitative-analysis problems are known to be undecidable. 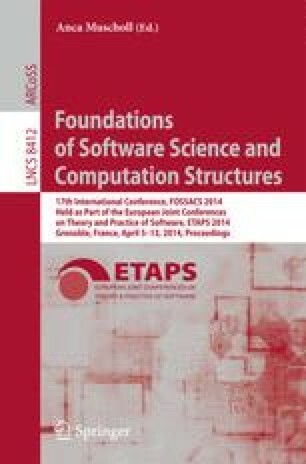 However in many applications the relevant question is the existence of finite-memory strategies, and the qualitative-analysis problems under finite-memory strategies was recently shown to be decidable in 2EXPTIME.We improve the complexity and show that the qualitative-analysis problems for partial-observation stochastic parity games under finite-memory strategies are EXPTIME-complete; and also establish optimal (exponential) memory bounds for finite-memory strategies required for qualitative analysis. This research was supported by Austrian Science Fund (FWF) Grant No P23499- N23, FWF NFN Grant No S11407-N23 (RiSE), ERC Start grant (279307: Graph Games), Microsoft Faculty Fellowship Award, European project Cassting (FP7-601148), NSF grants CNS 1049862 and CCF-1139011, by NSF Expeditions in Computing project “ExCAPE: Expeditions in Computer Augmented Program Engineering”, by BSF grant 9800096, and by gift from Intel.